This title deals with Psychological Assessment; Psychiatry; Psychotherapy, Clinical Psychology, and Counseling. It is suitable for psychiatrists and therapists with interest in the Rorschach and other projective tests. It contains thought-provoking contributions from the world of the Rorschach - including a special section on studies with children and adolescents that shows the rich potential of the Rorschach test in performing psychological assessment with this age group. This latest volume of "Rorschachiana" well illustrates the diversity of ideas and the many possibilities that projective methods can offer. The general section includes a blend of research papers, innovative methods, and complex theoretical ideas. A special section is dedicated to the Rorschach projective methods used with children and adolescents and includes a variety of papers from different countries, cultures, and methodological approaches. 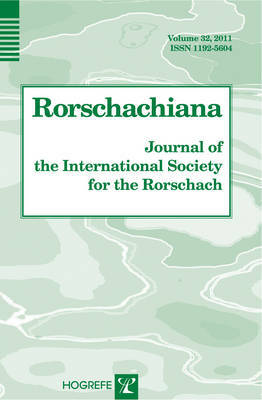 "Rorschachiana" is the official publication of the International Society for the Rorschach and Projective Methods, now with more than 3,000 members throughout the world, which for over half a century has played an important role in supporting the use of the instrument, as well as helping to develop extensive empirical research on its effectiveness in specific clinical situations. "Rorschachiana" is also available as a journal (ISSN 1192-5604).